However, when plotting the results, the random effect does not seem to follow a Gaussian distribution. Is there a way to correct that to improve the model? You may not want or need to worry about the departure from the normality assumption. Wood (2013) shows (in the Supplementary Materials, and mentioned in the text) that the test of the random effect term (as shown/performed in a call of summary() on the estimated GAM) is quite robust to failures of the normality assumption for the random effects. So, if you are wanting to improve the distribution of the random effects to better meet the assumptions of the test of the variance component, you may not need to, except at quite small sample sizes (Simon mentions some loss of power at a sample size of 100, for example). Should you (we) even care about the distribution? If you are just including this in the model to account for clustering in the data, perhaps we could simply appeal to Hodges (2016) and consider the penalized spline version of random effects as a convenient computational trick to estimate the things we want to estimate? Hodges, J. S. 2016. Richly Parameterized Linear Models: Additive, Time Series, and Spatial Models Using Random Effects, CRC Press. Not the answer you're looking for? Browse other questions tagged logistic random-effects-model gam mgcv or ask your own question. 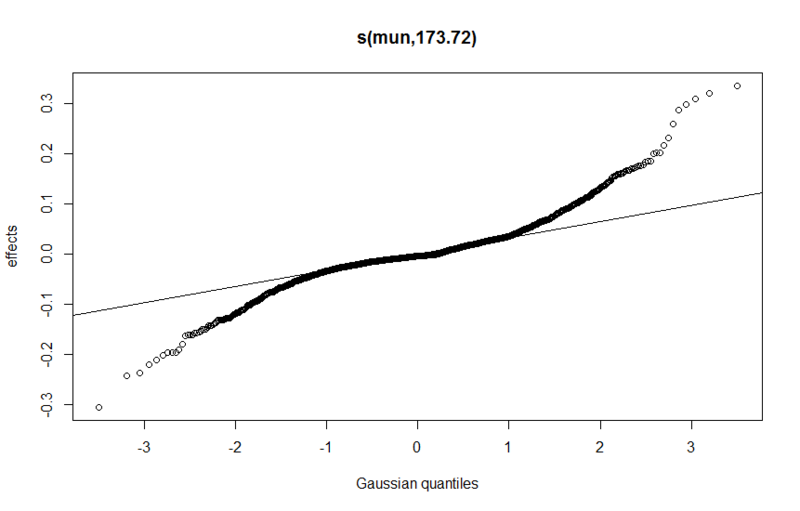 Is there a way to add covariates to centile GAM curves in R? Why do other smoothers change when changing a particular smoother in gam? How does Markov random field (bs=mrf) in mgvc gam handle repeated measures on the spatial units?